This Bath Two-Piece Suit Will Make Your Bathroom So Different! And You Will Like It! The Bath Two-Piece Suit Include: One Shower Curtain And One Bath Rug. Bath Rug's size is 23 inches (Width) x 16 inches (Height), 60cm x 40cm; Stock Size. 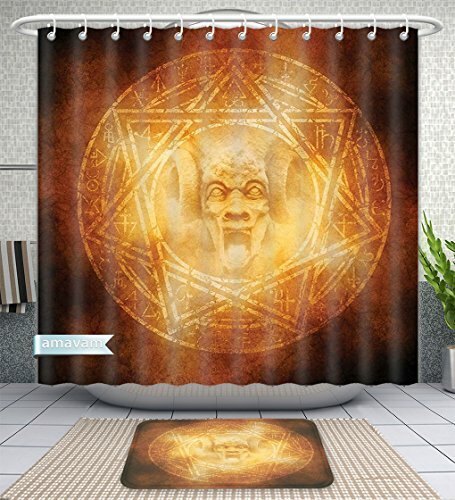 Materia Of The Bathroom Two-Piece Suit: Shower Curtain is Made of 100% Polyester, Bath Rug is Made of Rubber and Polyester. The Shower Curtain is made to be mildew and mold resistant by using antimicrobial technology. This product repels water which makes keeping your shower curtain clean even easier. This Shower Curtain is machine washable and can be used in the dryer. In addition, this product resists creasing and shrinking. If you have any other questions about our shower curatin, please contact us. We will answer as soon as possible.